Nothing was to be held back when it came to their single hearted devotion to God. It was to be a love offering of their entire being; heart, soul and mind. But as years passed, a familiarity set in that morphed into contempt. What was once offered as an overflow of gratitude to God became an obligation and duty. Eventually it was looked on as a burden to be borne out of tradition, even while resented. And they acted like it, too. The spotless offerings were changed into leftovers, spares, and animals that would not cost them anything to lose. Enter the prophet Malachi. God speaks to His people and confronts them with their heart condition when it came to worship. And a servant his master. To you priests who despise My name. Offer it then to your governor! Would he be pleased with you? Thus you bring an offering! “Wow!”, you might say. “They really messed up. It’s a good thing we are in no danger of that happening to us, since there are no animal sacrifices for worship now”. But wait, there are sacrifices of worship. They just are not animals anymore. But they are offerings of worship in they same way as before, and God expects our best. Did you see that? We have sacrifices to give, just like they did. Verse 15 parallels the command to love the Lord our God with our soul, mind and strength, while verse 16 is about loving our neighbor as ourself. You see, whenever we spend time in worship to God, He expects it to be with our entire being. That doesn’t mean that worship has to be an aerobic workout. It does mean that we need to be fully engaged in what we are doing during worship. Focusing on other things, offering half hearted or distracted worship, or inwardly despising and diminishing worship will produce a polluted offering to God! We each need to examine ourselves when it comes to our worship. Are we doing things out of routine and obligation, or out of love and devotion? Do we look forward to worship, or see it as an interruption? I challenge us all to be fully present during worship today, with our mind, soul and strength focused on our awesome God. Don’t insult Him by offering any less than your very best! The song was light hearted and fun, and we just assumed that with Jesus in our hearts life would be wonderful. But then life actually happened. There was loss, failed relationships, the death of a loved one, or even of a child. Life didn’t turn out to be full of blue skies and rainbows after all. For awhile, I resented this song because I saw it as one giving a false promise that Jesus was going to guarantee us a carefree life. But that has changed as time went on. One thing I saw, after carefully reading the lyrics, was that there was no such false promise in this song. There would be trials and pain in this life, but what the words say is that even in the hardest and most trying of times, we will be able to see the blue skies and rainbows that are there above us. You see, you can’t look at blue skies and rainbows when you are looking down or at yourself. Want this song says is that, by virtue of the fact that Jesus lives in our heart, we will have the strength to look up and see the blessings that are still around us and persevere in hope. Yes, we would be able to “count it all joy when [we] go through various trials” (James 1) and endure to the end. But what is the basis of that promise? How is the reality of that strength ensured for us? The chorus is the key. “Jesus is well and alive today”. Our guarantor of hope is that this same Jesus who died for our sins did not stay dead, but is alive and well today. 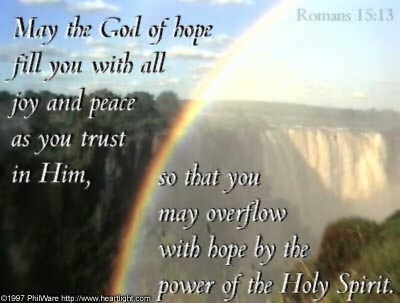 This same Jesus ever lives and makes intercession for us at the throne of God! And not only that, “He makes his home in my heart.” This is not a temporary residence, where he makes an occasional visit. As the lyric promises, “never more will I be all alone since He promised me that we never will part.” What a glorious promise, and yet it is just a reminder of what the Word has already spoken. Have you ever read about the miracles in the Gospels and the Acts of the Apostles and wondered what it would have been like to have witnessed them? The wonder and amazement you would have felt would have been life changing. I want to take a look at the healing of the lame man at the temple by Peter and John in Acts 3 and draw some lessons from it. The story goes further to include the preaching that occurred after the miracle, but my intention is to focus on the first part. One of the first things mentioned is that the man was born lame. This was no temporary condition from an injury that would eventually be recovered from. He had been born that way. Ever wonder why you can’t find a so-called faith healer attempting to heal people with conditions they have had from birth? No headings of those with deformed limbs, or Down Syndrome or conjoined twins. This also meant that everyone would know who he was and would have to give God credit for the healing. Another thing I see here is that this spot by the temple gate was where he was always taken. Jesus, during his earthly ministry, went to the temple numerous times. Surely he had seen this man there. And yet Jesus did not stop and heal him. By passing the man by, Jesus was demonstrating that it is not always God’s will to heal everyone right now. Jesus was directly led by the Spirit, and only did those things he was told to do. Was it because He had no compassion for this lame man? No, it was because, in this case, the healing was to take place later at a time that would bring glory to God and facilitate Peter and John preaching and souls being saved! After the healing took place, the man gave thanks and praise to his healer – God! He was not ashamed to openly and boldly let everyone know who had made such a dramatic change in his life. Should we be any less enthused about what God has done for us in Christ? We were all under condemnation and sentenced to eternal destruction. But someone, somewhere, at some time told us about Jesus. We heard, believed, repented, confessed Jesus as Lord,and we’re baptized. We are now on the road to heaven because someone has paid our penalty for us. Shouldn’t we be every bit as excited as the lame man who could now leap? Since the miracle had created an opportunity to preach, Peter and John seized the moment and proclaimed Christ to the crowd. They didn’t sign up those who heard as their partners and certainly did not take an offering to support the ministry. Jesus was the center of their ministry. Yet how many today claim power to heal, and will pray for you when you send in an offering? Another point I would like to make here is that throughout the rest of the New Testament, the Apostles went around the world starting one thing, and one thing only – churches! The didn’t start ministries in every city, the planted congregations! They didn’t even start ministries of their own. No Peter and John Ministries, Inc. no, the Great Commission was to be accomplished by churches, period! In the end, the lame man’s enthusiasm drew a crowd, and multitudes were saved. Let’s get fired up about what Jesus has done for us and see who asks us for an explanation for our joy! And may many souls be brought into the Kingdom! How would I react if faced with genuine persecution? I know how I hope I would react, but do any of us really know unless we are placed into that situation? I want to take a look at two men who experienced just that. Take a look over at Acts 16. Here we have Paul and Silas in ancient Philippi. They were God’s men, doing God’s work in God’s way. And the result? They are beaten with rods and shackled inside the deepest, darkest cell in the prison. What’s more, as a Roman citizen, Paul’s incarceration was illegal since he had not been tried! To add injury to insult, they were beaten with rods and received “many blows” to their bodies. This punishment was particularly brutal. Rods were not designed to break bones, they were designed to bruise bones. From what I have heard and read, a bruised bone is excruciatingly painful and slow to heal. And with their fresh set of painful injuries, they were fastened down with metal stocks in complete darkness. So of course Paul and Silas had the reaction anyone would have in a situation like this. They began singing and praising God! Notice what time it was. Midnight! They had not been singing for a few minutes or seconds. They had been at it for an extended time, probably hours! And their music was not just affecting them, but the other prisoners as well. At a time like that, perhaps the words of Jesus were flooding their minds, as the recalled Him saying, “Blessed are you when people insult you and persecute you, and falsely say all kinds of evil against you because of Me. Rejoice and be glad, for your reward in heaven is great; for in the same way they persecuted the prophets who were before you.” (Matthew 5:11, 12 NASB) So that is exactly what they did! And look at the effect their obedience had! The first jailhouse rock and roll broke out and there was a great earthquake. But the effect was not exclusively for Paul and Silas. 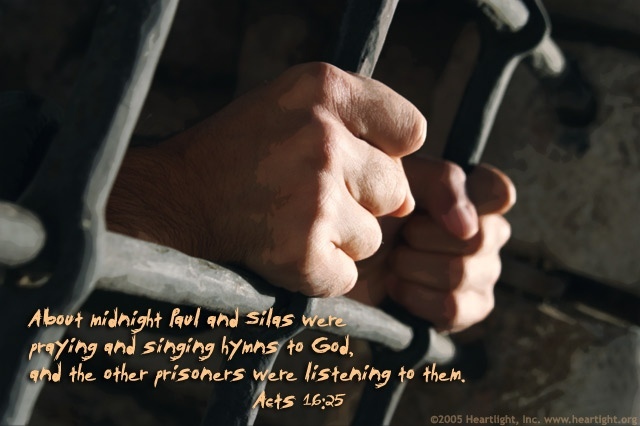 Their bold and joyous praises to God caused the other prisoners who had been listening to be set free, too! And later in the next few verses, it led to the salvation of the very man who had chosen the day before to send them to the armpit of the prison! If Paul had asserted his rights as a Roman citizen, the jailer and his family might never have been saved. What lessons can we glean from this account? 1. Doing God’s will, at the right time, in the right place, and in the right way does not mean we will never suffer. 2. The suffering and persecution we go through is nothing compared to the value of a soul! 3. The presence of pain is not the absence of God! 4. If you are surrounded by darkness, you can be a light. 4. Our obedience in the face of adversity will not only deliver us, but can be used by God to set others free, too! 5. Never underestimate the lengths God will go to in order to give someone a chance to hear the Gospel and see it lived out in you! 6. Next time you are singing praises to God, remember that there may be someone who can hear you that needs what we’ve got in Christ Jesus! So don’t hold back. 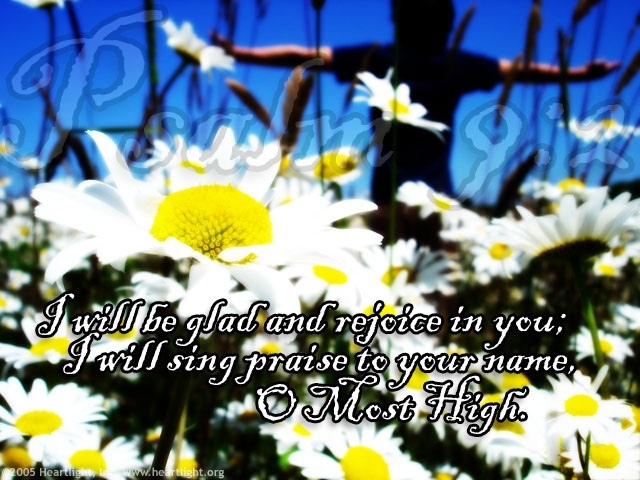 Rejoice and be exceedingly glad!